I love a good sale and was thrilled to pick up some excellent finds at the Biome sale this weekend in Paddington (my favourite eco-friendly retailer). Prices were excellent (more than 50% off), and now I have Mother's Day and upcoming birthdays and babies all sorted. 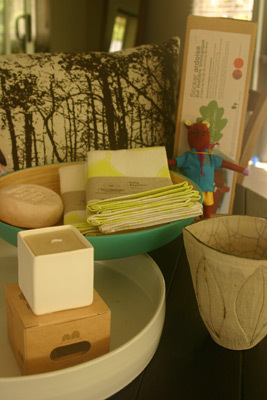 Some of my booty includes Blossom Creations napkins, KAS Australia pillow, a gorgeous Lucy Vanstone ceramic vessel, Bambu dish, olive oil soap, Queen B candle, a mouse, a Sigg bag, Coco Boheme chalk stickers and a Putumayo CD. Thrilled!